Drum/Tote Oven safely heats flammable materials. Suitable for Class I, Div I areas, Sahara Hot Box delivers precise temperature control and uniformity. Heating capability is based on application requirements, and steam, hot oil, or hot water can also be used as heating medium. Suited for heating hard-to-melt materials, forklift-portable Model E8 is insulated and features steel construction asÂ well as built-in spill containment. Design alsoÂ includes digital temperature control, independent over-temperature control, and air circulation blower. Benko Products, Inc., a leading innovator in industrial ovens, announces that its line of Sahara drum/tote ovens is suitable for use in Class I, Div I areas. Many companies are facing the problem of how to safely heat flammable materials. It is critical that operators take the proper steps to ensure the material being heated never reaches the autoignition temperature. Autoignition temperature of a material is the lowest temperature at which it can spontaneously ignite in a normal atmosphere without an external source of ignition, such as a flame or a spark. Sahara Hot Boxes provide the solution with precise temperature control and temperature uniformity, making it suitable for use in Class I, Div I areas. The Sahara Hot Box pictured electrically heats 8 drums on pallets or 2 totes. Steam, hot oil or hot water can also be used as the heating medium. The heating capability of each Hot Box is designed based on the customers’ needs. With over 30 years of drum warming experience, Benko Products can accurately calculate and predict heat up times. The Model E8 is ideal for quickly and safely heating hard-to-melt materials. The Sahara Hot Box Model E8 is fully insulated and features rugged steel construction, built-in spill containment and is portable; just pick up with a forklift. This oven is shipped completely assembled and tested for easy installation. It is designed to include digital temperature control and independent over-temperature control as well as an air circulation blower for temperature uniformity and fast heat-up of drums or totes. 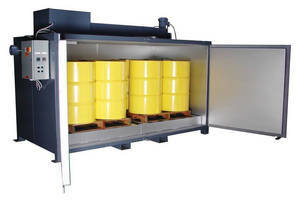 Drum/tote warming ovens have become a popular choice in the industry as they offer the energy efficiency, fast and reliable heat up times and safety that other heating methods such as band heaters or large in-plant hot rooms cannot. For more information on the Sahara Hot Box Model E8, contact Benko Products, Inc. at (440) 934-2180 or go to www.benkoproducts.com to request an online quotation.